HOLKER (LOWER), a village and a township in Cartmel parish, Lancashire. The village stands 2 miles SW of Cartmel town, and contains several neat residences. The township includes also the villages of Cark and Flookburgh; and is conterminate with Flookburgh cha pelry. Acres, 2,130. Real property, £4,600. Pop. in 1851, 1,225; in 1861, 1,160. Houses, 243. The decrease of pop. was caused by the removal of operatives to the iron ore localities. The manor belongs to the Duke of Devonshire. Holker Hall, a seat of the Duke, is a spacious edifice; has recently undergone much improvement; contains a fine collection of paintings; and stands in a well wooded park, extending to the shore of Morecambe bay. Local studies information is held at Cumbria Record Office & Local Studies Library, Barrow and at Kendal library. Details about the census records, and indexes for Lower Holker. You can also perform a more selective search for churches in the Lower Holker area or see them printed on a map. The Register Office covering the Lower Holker area is Ulverston. Ask for a calculation of the distance from Lower Holker to another place. "FLOOKBURGH, (or Flookborough), a chapelry in the parish of Cartmel, hundred of Lonsdale, county palatine Lancaster, 2 miles S.W. of Cartmel and 5 E. of Ulverston. Newton-in-Cartmel is its post town. It includes the township of Lower Holker. The Ulverston road passes through the village, which was once a market town. Iron ore is obtained in the neighbourhood, and there is a chalybeate spring. The living is a perpetual curacy in the diocese of Carlisle, value £121. The church is a stone structure dedicated to St. Mary. There are charities producing about £16 per annum. Here is a school for both sexes." "LOWER HOLKER, (and Upper Holker) townships in the parish of Cartmel, hundred of Lonsdale North of the Sands, county Lancaster, 2 miles W. of Cartmel. They are situated on the river Leven, near Morecambe Bay. Lower Holker comprises the extensive village of Flookburgh. There are many villa residences, and several extensive iron forges. Holker Hall is the seat of the Marquis of Hartington, who is lord of both manors. The Hall is a noble building, situated in an extensive and well-wooded park. The interior of the hall contains a choice collection of paintings, among which may be mentioned the Duchess of Cleveland, by Lely, Lord R. Cavendish, by Reynolds, a landscape by Rubens, Vandyck, by himself, Sir J. Lowther or "Farthing Jemmy," Admiral Penn, &c. The upper township contains the hamlets of Beckside, Bigland Hall, and the Low Wood gunpowder-mills, with several scattered farmhouses and cottages. In 1835 Lower Holker was a township in the parish of Cartmel. 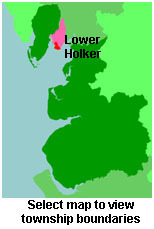 You can see the administrative areas in which Lower Holker has been placed at times in the past. Select one to see a link to a map of that particular area. View maps of Lower Holker and places within its boundaries. For probate purposes prior to 1858, Lower Holker was in the Archdeaconry of Richmond, in the Diocese of Chester. The original Lancashire wills for the Archdeaconry of Richmond are held at the Lancashire Record Office.